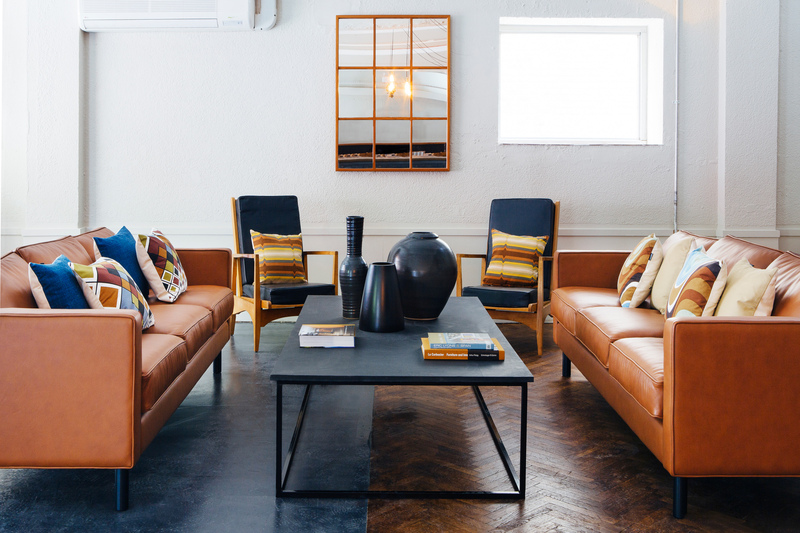 Just a minute walk from Wood Green station is the artsy Green Rooms Hotel, it’s an artist hotel, offering affordable rates to creatives, along with the option to use the rehearsal space. It features 22 double rooms, two studio apartments and two dorms (which is in the process of upgrading to studio apartments). On the top floor is a large studio space, used for talks, performances, art exhibitions and to rent out for private events. A great looking hotel, thanks to Nick Hartwright, the brainchild behind Green Rooms Hotel, who also set up The Mill Co Project. Whats so fantastic about The Green Rooms is, not only do they offer affordable accommodation to artists, but they also invite chefs to set up residencies, where they are given a kitchen and dining area free of charge, with business support. 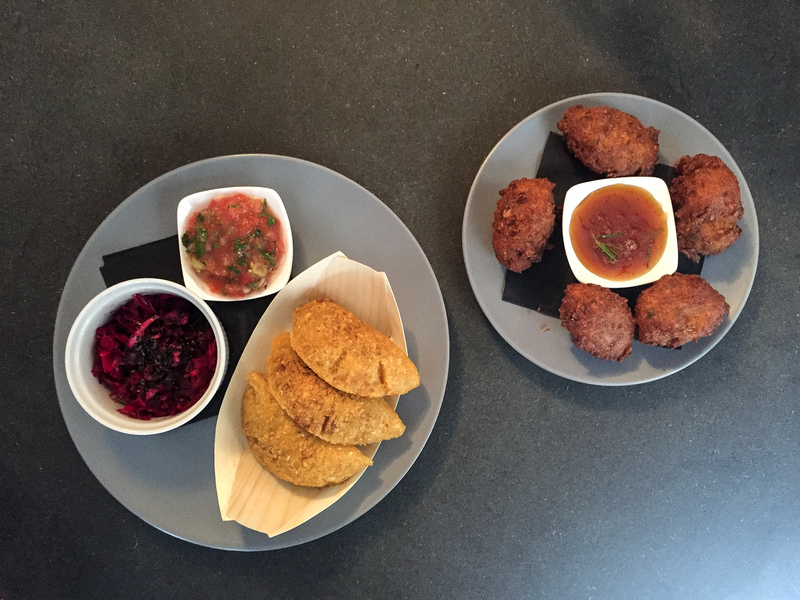 We headed on down to check out the current resident, Colombian Street Kitchen, headed by Colombian chef, Esteban Arboleda. The restaurant is on the right as you walk into reception, the seating is nicely spaced out and it feels light and airy. Our waitress was very welcoming and great in recommending different dishes. We went for the meat empanadas, which in my option, stole the show! it was nice and crispy on the outside filled with perfectly cooked shredded beef and potato. The sweetcorn croquettes was another firm favourite, served with homemade melao syrup (cane sugar and rosemary), again nice and crispy on the outside and bursting with flavour on the inside, the sauce gave a nice twang to the croquettes. The grilled arepa, was slightly larger than expected, home-made corn flatbread seeded black quinoa and toasted sunflower seeds, with beans, spicy salsa, guacamole and coriander, we chose the one that came with chicken, coming in a generous sized portion. The adobo chicken wings were nicely marinated Colombian style, served with a spicy beetroot. There are only two desserts on the menu and going on how great the mains were, it would be nice to see more dessert options available (hint hint). For desert we went for the Guava Crumble, which contained guava, caramel, plantain and coconut rice topped with alfajor biscuit and fresh cream. It was a sweet dessert, bursting with interesting flavours and just the thing to finish off the meal nicely. Would I go back? YES, it’s honestly great Colombian street food taken to the next level, with flavours that will have you talking for days! The restaurant is open six days a week and Colombia Street Kitchen will be there until 17th February 2017.